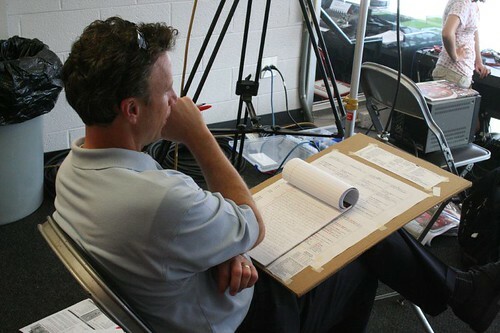 Athens, GA (Aug 30, 2008) - In a quiet moment in the television booth at University of Georgia's Sanford Stadium, CSS' Matt Stewart goes through his notes in preparation for the game between Division I-AA Georgia Southern and the #1 Ranked University of Georgia. Georgia won the game 45-21. Photograph Copyright 2008 by Eye on Sports Media/The Cayuga Group, LLC. All Rights Reserved.